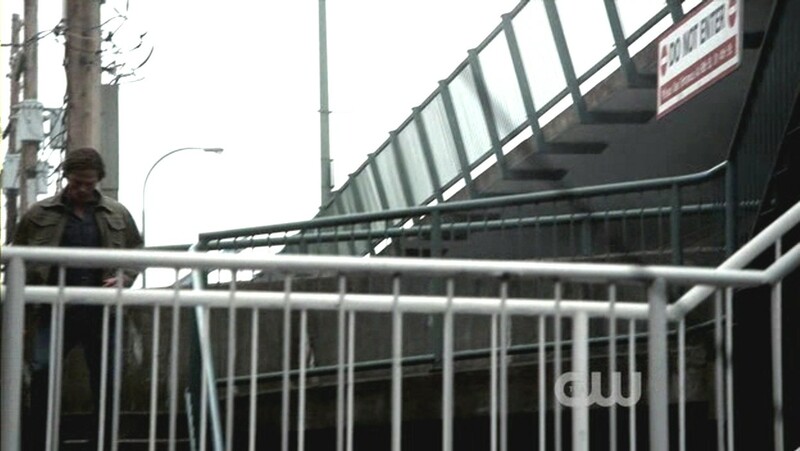 Supernatural has had some beautiful design and direction over the seasons, but I don't know when I've seen a frame I liked quite as well as this one from 5.01. Sam is very, very low! Blip. 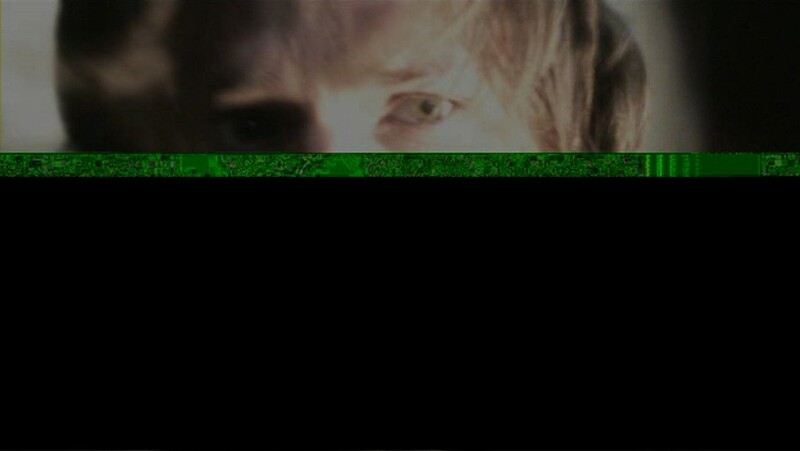 (I stared till I was crosseyed but I didn't see any hidden 3D picture.) There's a break in reality. Then they're on the, um, "soul plane". As in dead? Limbo? Between lives? And the Devil says to [Yosemite] Sam, "I could use a guy like you." And then the rest of the story unfolds. Well, owzers had a fascinating theory about it, and I think I concur: this whole ep is Sam's guilt-wracked hallucination as he is being taken over by Lucifer. But more screencaps of symbolism. He descends, past a very Ruby2-looking woman, towards a level twice as low as "Ruby". 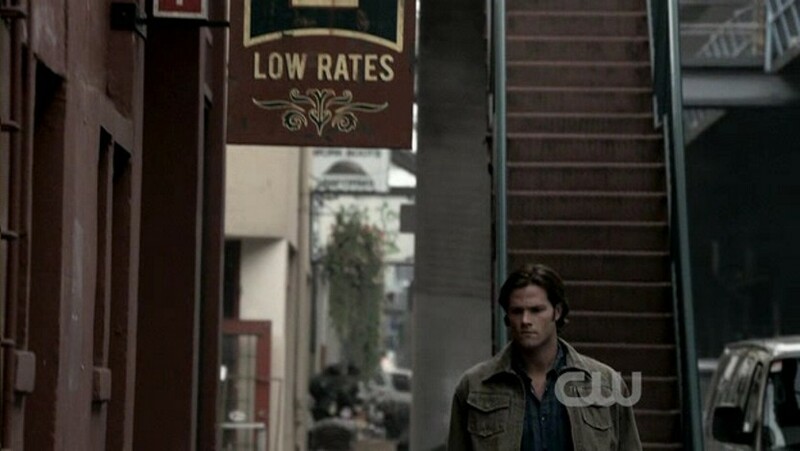 In the very sleazy motel, he is lower than Dean. This motif recurs throughout the ep. When Dean comes down to his level, he gives this very Sam-like gesture, and look! 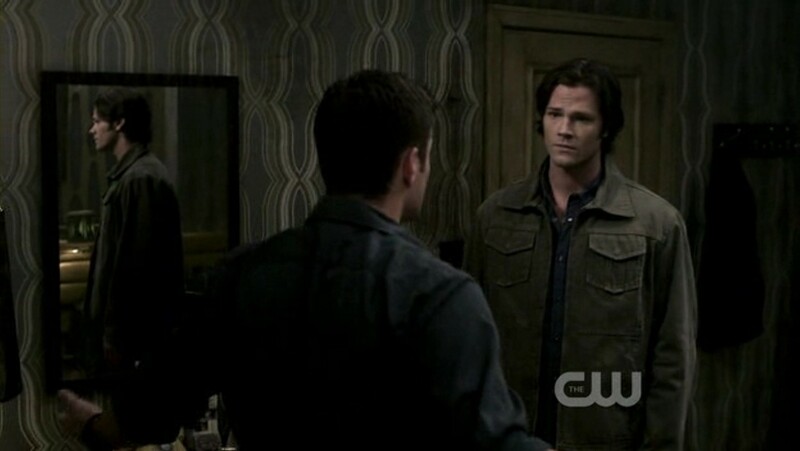 There are two Sams--real and reflected. which has nothing to do with anything except guh. Aw, but it was fun! I didn't see any special effects or anything, but Bobby is definitely staring at that palm and not at Dean's face, when he's in control of his body, just before he stabs himself. Oh you're a DOLL! Thank you! 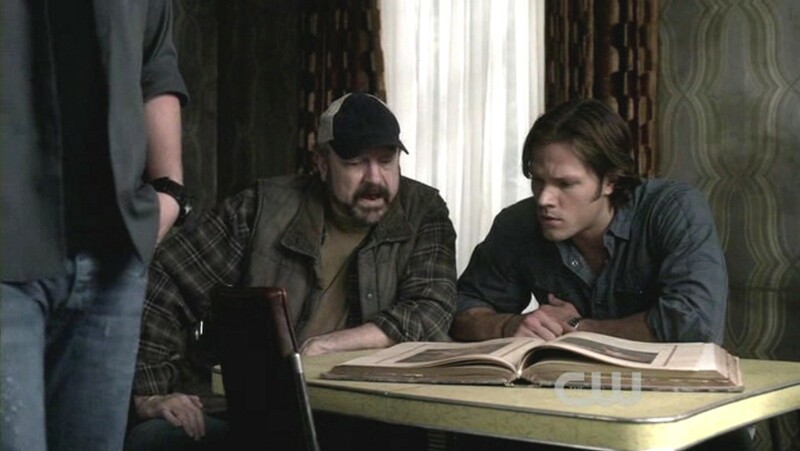 I was right then, that Bobby's attention was on Dean's hand! It's interesting, because, if you think about it, why would dean hold his hand up like that? Why not try to use it to hit Bobby in the stomach or face or whatever? No, I don't think you're over-reading it. That whole scene is just odd. Bobby and Dean stand there in a kind of armlock (very visible in the cap above), Bobby's hand on Dean's, um, clavicle (hee!) and Dean gripping Bobby's shirtfront and pushing him away, and they stay that way throughout Meg's little speech. It's either a sudden terrible lapse in Robert Singer's usual good directing, or there's a kind of demon-standoff-y thing going on. I mean, Meg has time to chat with Dean, plant the kiss on him, comment some more; Dean has time and energy for snark; and THEN Meg hands Bobby the knife and gives him permission to cut Dean up. 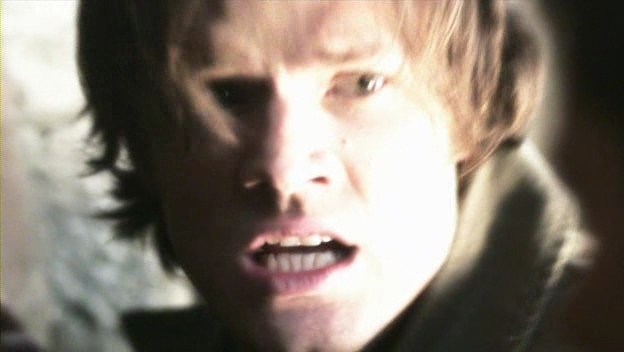 Bobby-demon even hesitates, looks around for additional permission, is goaded into action by Meg--and all that time Dean is standing there, leaning sideways toward his left hand like maybe he's trying to reach for a weapon on his left hip or thigh. Then up comes the left hand of presumed angel smiting or something. IDK. It is a strange scene. Hard to believe Kripke and Singer boxed themselves into a corner on such an important plot moment and had no other choice, so I'm going with "might mean something" until they once again prove my faith in them to be misplaced. They've certainly done it before. I'm going with "might mean something" until they once again prove my faith in them to be misplaced. Overall though, they do tend to have methods for their madness. In most other shows (NCIS, for example) I'd just have assumed crap directing or writing, but in SPN there's at least the possibility for it to mean something more. I cling to your perspective at least until next Thursday night! I'm just keeping my fingers crossed that there is a reason that Bobby was able to do the near impossible thing of take control back from a demon. Otherwise, I shall be very grumpy. Daddy Winchester did it once too. Maybe it's a father-figure thing. He's the only other example I can think of and I'm trying to remember the specifics of exactly when that happened. 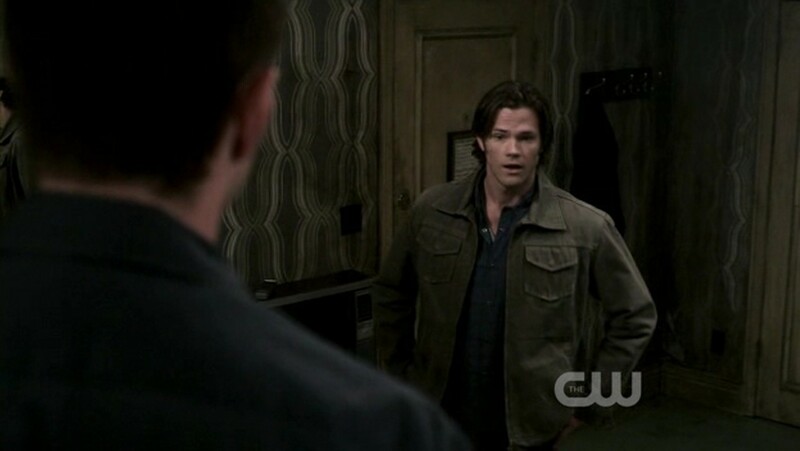 Dean was in the room, but I can't remember if he was looking at Dean or not. He was lying on the floor in that cabin at the end of S1. Azazel had pinned Dean to the wall and he was hurtin'. Sam had the Colt. John got control for a few moments and begged Sam to shoot him, but it we could never be 100% certain that it was John, even though the eyes stopped being yellow. I don't think he looked to Dean, but I'd have to watch again to be sure. I think you're right. Oh well, there goes my theory.